Lodged amidst the Andes in northern Ecuador, the Imbabura Province is a mountainous paradise surrounding the Cotacachi Cayapas Ecological Reserve, home of the Cotacachi Volcano! Next to the park sits Otavalo, a small traditional town with great architecture and friendly people. 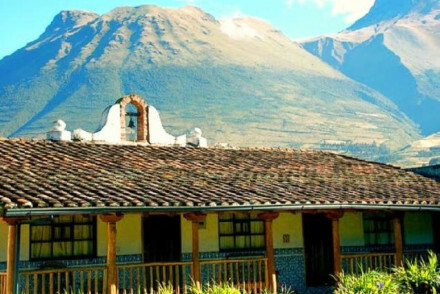 We’ve selected the best places to stay in Imbabura Province to make the most of both the towns and countryside. Ibarra, the capital of the province sits between the Tahuando river and the Imbabura volcano. Although established centuries ago, an earthquake in the eighteen hundreds destroyed much of the traditional architecture and Ibarra is now considered the youngest city in Ecuador. However, the city’s heritage can still be seen in the close by Inca-Caranqui archaeological site and the town itself is popular with tourists thanks to its pretty white washed buildings and cobbled streets. Otavalo is a buzzing market town which holds a weekly event and is a must visit for those wanting to pick up original handmade Ecuadorian crafts. The townsfolk are particularly famous for their weaving and textile making skills (which reputedly date back to Incan times). The weather in the province is mild, ranging between ten and twenty degrees year-round so bring a jumper for the evenings! To avoid the rain, aim to visit between June and July or January and February. Laguna Cuicocha is an extinct volcano now known for its crater lake containing two stunning lava islands! Visit Otavalo Market to stock up on cold weather clothes! A colourful place selling Indian goods and a great selection of woven products. Hike up to see the Peguche Waterfall and the well preserved surrounding area. The stunning falls are best visited early in the morning to avoid the crowds! 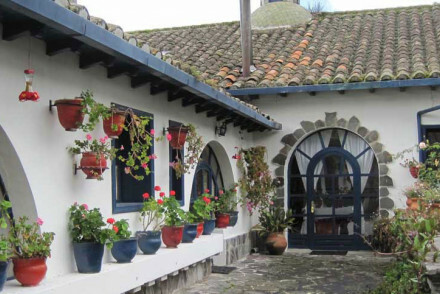 Hacienda Zuleta is a charming and luxurious hotel with antique furniture and a only short walk from Otavalo town centre. Hop on a horse and go exploring the local area before returning to base for some fantastic local dishes! Near the San Pablo lake, Hacienda Cusin offers a touch of traditional Ecuadorian comfort with fantastic local food, cosy fireplaces and beautiful antique furniture. Imbabura Province does not have an international airport, so you need to fly to Quito then jump on a bus or taxi to Otavalo. Best time to visit the Ecuador's Northern Highlands is between June and September when temperatures peak at around 24 degrees celcius. The temperature is fairly constant year round, with the heaviest rains coming in April. Want to hire a car for complete independence? We recommend you visit our online partner Rentalcars. A lovingly converted estate boasting an enviable location amongst the Ecuadorian Sierra. Charming rooms are traditional in style with antique furniture, warm hues, local textiles and fireplaces. Feast on regional cuisine and spend days in the great outdoors. A truly authentic experience. Country Escape - A restored estate in the stunning Ecuadorian sierra. The ideal space to get outdoors and unwind. Sights nearby - Discover the Cochasqui earth pyramids dating back to 800 A.D.
A luxury converted ranch packed full of charm. Gloriously light rooms feature domed floor to ceiling windows, parquet flooring and antique furniture. Spend days riding horses or exploring the land on foot before returning to superb homemade Ecuadorian dishes. A truly authentic rural experience. Country Escape - Have a quintessential rural Ecuadorian experience (albeit a luxurious one). Active Holiday - Enjoy the great outdoors over long walks or horse treks. Birdwatching - The unique biodiversity in the area makes this an excellent spot for bird watchers.